Well, Kim Kardashian, you’ve had a full week in the headlines, compliments of your divorce drama. Fortunately (or unfortunately?) for you, there’s a new household name in the limelight this week: Joe Paterno. No, he doesn’t have his own fragrance, clothing line, or…. ahem…. tape…. but he does have a few other things that are kind of a big deal: the most wins (409) of any coach in the FBS (Football Bowl Subdivision, formerly known as Division I-A college football), a spot in the College Football Hall of Fame, and most importantly, the respect and love of thousands of people across the country. At least he did up until this week. Amidst recent allegations concerning a former staff member of Paterno, Jerry Sandusky, good ol’ Joe Pa has found himself in a situation that makes Kim K’s latest news seem EVEN less important (is it possible?!). Even Jim Tressel’s “you should have known better”-moment fades instantaneously in the shadow of this doozie. Yes, it’s that bad. 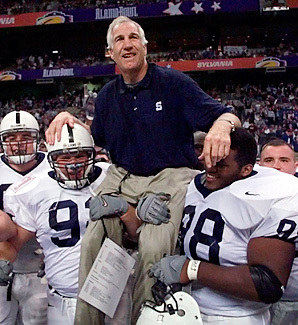 Sandusky, a former player of Paterno, served as an assistant coach at Penn State from 1969 until his retirement in 1999 (defensive coordinator from ’77-’99). He was indicted on 40 counts of sexual abuse involving eight boys over a span of 15 years. What does this have to do with Paterno? According to reports, allegations of sexual abuse date back to as early as 1994. However in 2002, current assistant coach Mike McQueary (who was a graduate assistant at the time) witnessed Sandusky sexually assaulting a young boy in the team’s locker room shower. I’m still wondering why McQueary didn’t do something to stop it in that very moment? He, did however, tell Paterno about it the next day. The head coach apparently fulfilled his “legal requirement” by reporting the incident to university administrators, despite not relaying the information he had to law enforcement. Hold up. 2002?….. 2002?! This happened almost a decade ago, and according to ESPN.com, Sandusky still had access to Penn State facilities, including the weight room, as recently as last week! SO many people dropped the ball here it’s hard to know exactly where to start. Bottom line is, these ADULTS had an obligation to the poor children that have been victimized by this Sandusky creep. Not to mention, hundreds of other young children who have been left in the same danger since Penn State officials chose to turn a blind eye to Sandusky’s actions. They knowingly allowed a sexual predator to walk free and even continued allowing him access to the facilities where these crimes took place. Yeah, yeah…. I know these are just allegations at this point, but COME ON! Joe Paterno is just one of many competent adults that should have done more. Believe me, I think the others are just as much to blame, if not more. But Joe? He’s the FACE of the University. He is Penn State! You would think a man in his position, who has walked a straight line all these years (only one minor NCAA violation in 62 seasons at Penn State), would recognize the magnitude of this situation. Then again, maybe he did. Maybe he knew precisely the impact a scandal like this could have on his beloved University. A few years ago I spent three days in State College, Pennsylvania (home to Penn State University), while playing in a volleyball tournament there. My teammates and our families explored the quaint little college town as much as our schedule allowed during our visit. I loved it. When I heard the news of this story however, I thought back to a conversation my parents had with a State College local about Joe Paterno during our trip. The man said every once in a while, he’d see Paterno cruising around town in his “old” car. He said that Paterno, a very modest man, (whom we know makes over half a million dollars a year, a modest salary for a coach of his stature) “pours” his money right back into the University and the community. This man was clearly proud of his coach, as he should have been. Joe Paterno’s loyalty to Penn State University is without question. He has proven his loyalty for decades. In 1969, he turned down the head coach position for the Pittsburgh Steelers. He turned down the New York Giants multiple times. Add to the list the University of Michigan. He actually accepted an offer by the New England Patriots at one point, only to back out of it three weeks later to return to Penn State. He’s never been about the money. He’s always been about Penn State. That considered, was it his loyalty to the University that held Joe back from sharing his knowledge with law enforcement? 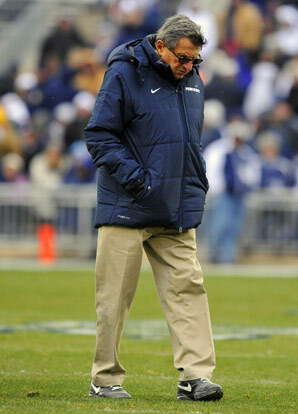 Could he not bear the thought of his word, his decision to step forward, bringing shame to his darling, Penn State? I really don’t think it was his loyalty to Sandusky. One can only imagine the moral dilemma this man has been faced with, and probably burdened by all these years. Ultimately, Joe decided to protect his school and his program rather than the children involved. He had a responsibility as an adult and a role model to do the right thing. In this case, it was the head coach (along with other school administrators) that fumbled. Still, Penn State students and fans stand behind their coach. The video below was taken last night as Joe Pa leaned out his front door to thank the hundreds of supporters who had gathered at his residence. This whole situation is incredibly sad. My heart hurts for the victims and their families, first and foremost. That being said, it’s a sad time for the State College community, and the sports community in general. Another one of the greats now has a tarnished story. It’s always a sad realization when you learn that someone you’ve held up so high isn’t as admirable as you once thought he or she was. The Nittany Lions will take the field some time before noon this Saturday, hosting the newest member of the Big Ten, No. 19 Nebraska. For the first time since 1950, will Paterno be absent? What do you think about this situation? Is the heat Paterno is under jusitfied? If so, what consequences should he face? 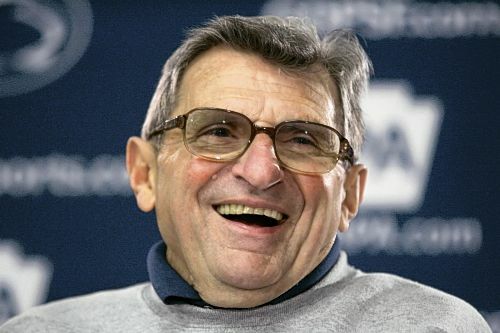 I was listening to Mike & Mike discussion this morning and I was telling Mark that I was sure Paterno wasn’t for any of the events that happened….his reason for not being diligent about talking about it could be for the very fact that is loyalty just may outweighed whatever he knew. I completely agree with you! I completely agree with you that he didn’t step forward bcuz he wants to protect the college. 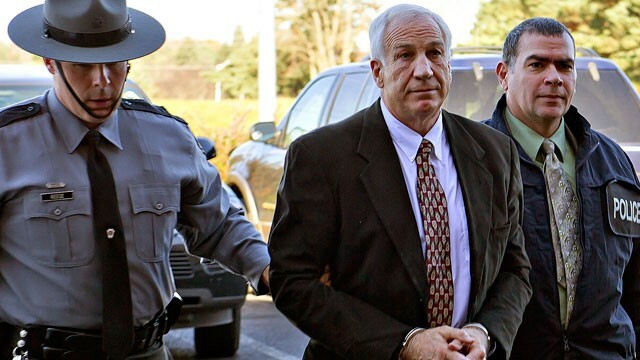 If he was willing to refuse those job opportunities(that were millions of more dollars) bcuz of his loyalty to Penn state than of course he would refuse to do the right thing & come forward to law enforcement! U hit this nail right on the head lex!!! Tim Tebow: Love Him or Hate Him?